When you're über-rich and short on time, the Saker S-1 will get you there faster than sound itself. 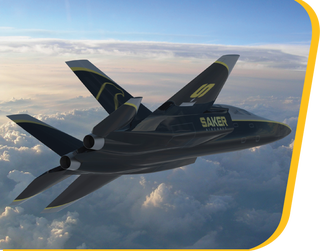 This projected concept aircraft, hailing from company by the name of Saker Aircraft, is attempting to sell itselves on the basis that it's the ultimate tool for getting the most out of time. Which certainly will be true, if the aircraft ever makes it beyond the drawing board. If any Kinja's out there know anything about the company and the people behind this idea, please make yourself heard down below. So, let's get some tech specs on this bird, which in my opinion looks somewhat like an F-15. While this obviously is is no full on acrobatic aircraft or fighter jet performance-wise, the projected performance specs are still good enough for just about everyone. The range map above indicatss wheee it could get you on just the inboard tanks. The gas bill isn't going to give you a heartache either, at just $2/nm. I really do wish the guys behind this project the best of luck, and I'm sure you guys do too. They are apparently taking on advance orders, according to their contact page. You and your rich buddy wanna play Maverick & Goose? Here's your ride, buddy. Get another one and you can get Iceman as a wingman for the ride. You could even get to say "Hey you! You can be my wingman anytime." The reply you'll probably get is "No, you can be mine."